If there is one thing I appreciate, it’s a beautiful handbag. There are shoe girls and there are bag girls and I AM A BAG GIRL. Soft leather, golden hardware… bring them on please. I am of the strong belief that you can really tell a lot about a person by the bag they carry (and I’m not just talking about registered, statement handbags). But do you ever wonder what goes into designing those works of art you carry on your shoulder or sling cross-body? Well, we are going to find out. Luckily, I am blessed to be friends with Katie Kalsi, one of the hottest, up-and-coming handbag designers. She happens to live in Memphis and in less than three years, Katie’s bags have graced the arm of Cameron Diaz, Faith Hill (who personally contacted Katie about her love for Katie’s bags), Nicole Kidman, Lisa Marie Presley (who affectionately calls Katie the “Guitar Strap Girl”), rocker Pat Benatar, Sandra Bullock, American Idol‘s Katherine McPhee, January Jones, country singing sensation Julie Roberts, Marlo Thomas and her sister-in-law Annie Thomas, who commissioned Katie to make her a one-of-a-kind clutch for Jennifer Aniston’s 40th birthday party. Pretty strong. I recently sat down with her to discuss how she started the Katie Kalsi line. CG: How did you come become a handbag designer? KK: I began as an artist — painting on canvas with acrylics and oils. I have certain designs I do in different colors and sizes and thought they would be fantastic on handbag straps. I love modern art — shapes and colors and textures. Experimenting is key to getting it just right. I had no previous sewing experience, but I hand-stitched 24 hobo-style bags in my art room at my house. I bought skins of leather and cut the leather into shoulder straps. I then took designs from my signature paintings and painted those same designs onto the straps. I then attached the shoulder straps to the bags with fabulous hardware. The bags were a hit and I was hooked. In the meantime, I took a sewing class to further my handbag-making skills and to learn all of the aspects of production. I converted an old barn behind our house into a design studio where I now design all of my prototypes. CG: Tell us about your handbags. What makes them so amazing that every girl I know wants to get their hands on one? KK: I saw an opening in a niche market for something different. I take classically shaped bags — such as the doctor bag — and add a little bit of funk and fun. I don’t add too much in the way of grommets or lace or skins because I don’t want to over-do it, that way I appeal to a broad market. Just enough for a wonderful mix of traditional with clever designs. 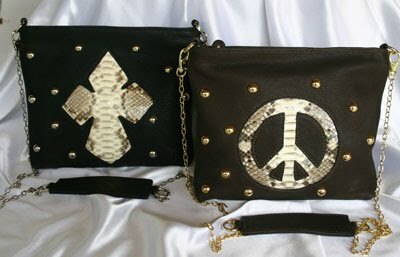 Traditional bags with attitude! CG: What goes into designing a handbag. How long does it take? KK: I carry my sketch book with me wherever I go and as soon as an idea hits, I draw it. It doesn’t take long for me to get the idea on paper. I then decide what size I want this particular bag to be, do I want it to have a zipper closure or a snap, etc. What medium do I want to use to make the design on the bag? Snake skin? Leather? Suede? I’ve recently designed a bag using a lightweight copper metal for the design. KK: The expense of manufacturing is probably the biggest challenge right now, given the state of the economy. At this time, everything I make goes right back into the business. Making sure the bags are made to my specifications is another big one. I often travel to Texas to make sure everything is done just how I want it. CG: How do you keep your life in balance as both a mom and business owner? Any health tips? KK: I’m crazy every day and often wish I could clone myself. I have a wonderful support staff who is behind me all the way and I can always rely on them. Victoria is typing this right now! I do make sure I find time to work out at least three times a week. It boosts my energy and clears my head. 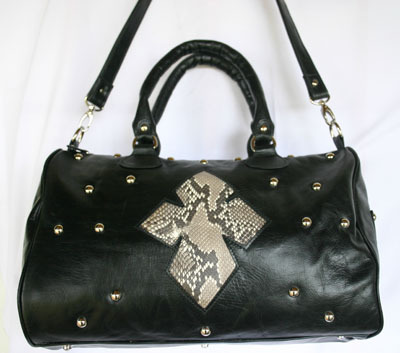 Katie’s handbags are sold at Joseph, Southern Couture and by special order. Visit katiekalsi.com to see her other styles, including those with hand painted, interchangeable straps. And as always, keep counting!